To order a printed copy of the Golden Eagle Luxury Trains - Sicilian-Odyssey brochure, simply click the Request button below. Golden Eagle Luxury Trains provide expert-led private rail journeys tours across Europe, Russia, Central Asia, China and Iran. Be one of the first to experience their exclusive tour of Italy in 2019. Download the brochure now. The Sicilian Odyssey tour is a 12 day exploration of the finest scenery and attractions in Italy. You'll see ancient history, vast architecture and spectacular coastlines on either of their captivating routes between Venice and Taormina. Discover delicious food in Bologna and get a guided tour through the old-town in Bari where you'll gasp at its domineering fortress and castle. Explore the enclaved microstate of San Marino or choose to take a test drive at the Ferrari factory in Maranello. The signature experiences are endless. Visit Pompeii and see the hair-raising remains of the momentous eruption that has been preserved since 79AD. See the wonderful attractions of Rome starting with an introductory tour of the World Heritage sites. There's endless photo opportunities! Prices from £9,495 per person. 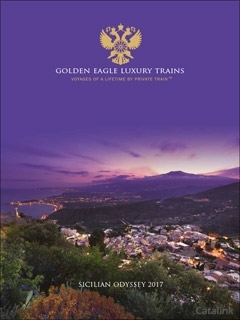 Request the Golden Eagle Luxury Trains - Sicilian Odyssey brochure today to start your journey here! By pressing the Request Printed Brochure button you give consent to Golden Eagle Luxury Trains - Sicilian-Odyssey (and their Data Processors for the specific purpose of delivering your literature) to send you their Brochure .